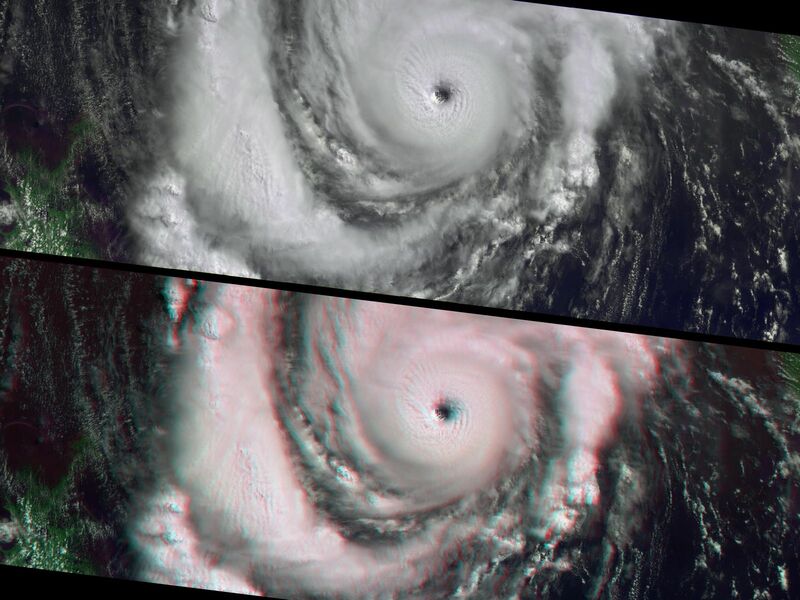 Characteristics of a strengthening Category 3 Hurricane Lili are apparent in these images from the Multi-angle Imaging SpectroRadiometer (MISR), including a well-developed clearing at the hurricane eye. When these views were acquired on October 2, 2002, Lili was approaching the Gulf coast of the United States and rapidly strengthening toward Category 4 status. The storm's power reached its peak less than twelve hours later, and although it weakened overnight, this was still a dangerous system as it blew across the Louisiana coast on the morning of October 3. Lili was the first hurricane to make landfall in the United States since Hurricane Irene in 1999. Twenty-eight parishes in Louisiana were declared disaster areas, yet this hurricane fortunately caused much less damage than what could have resulted from an event of this magnitude. 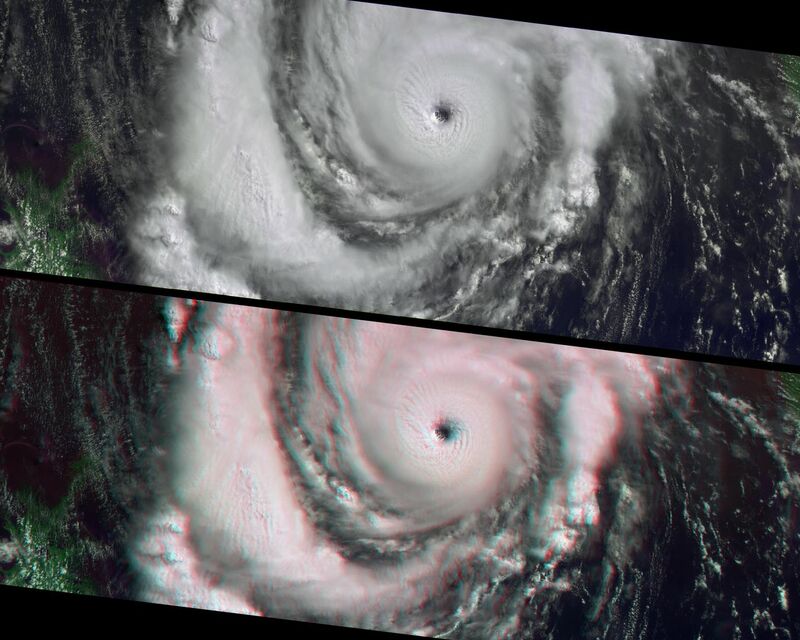 The top panel uses data from MISR's vertical-viewing (nadir) camera and data from the red, near-infrared, and blue spectral bands is displayed as red, green and blue to create a false-color view in which land surfaces appear bright green. 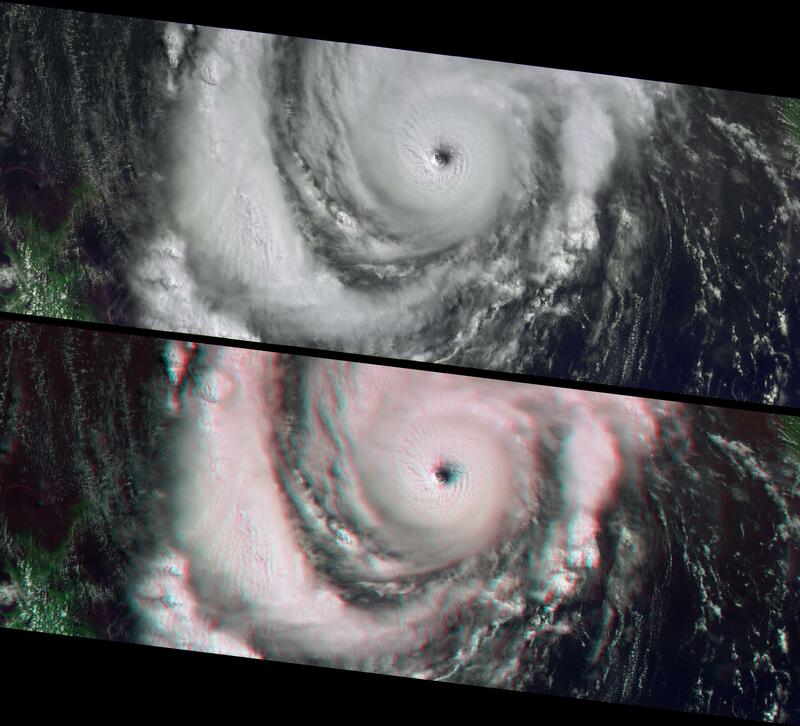 The nadir and stereo anaglyph views are identical in their band choices, except that the anaglyph uses data from the 26-degree forward-viewing camera for the red band. The images are oriented with north to the left. 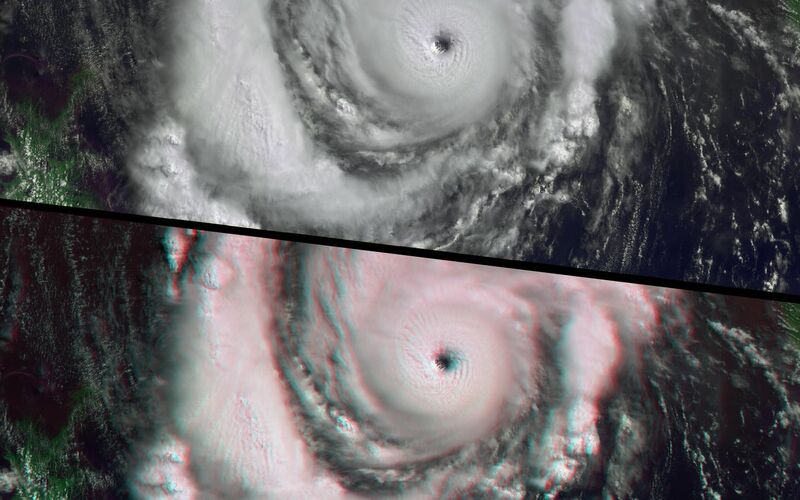 Observing the spectacular three-dimensional structure of the hurricane eyewall and of convective thunderclouds present in the storm's spiral arms requires the use of red-blue glasses, with the red filter placed over your left eye. Information on ordering glasses can be found here. The Multi-angle Imaging SpectroRadiometer observes the daylit Earth continuously from pole to pole, and every 9 days views the entire globe between 82 degrees north and 82 degrees south latitude. These data products were generated from a portion of the imagery acquired during Terra orbit 14844. The panels cover an area of about 380 kilometers x 985 kilometers, and utilize data from blocks 67 to 73within World Reference System-2 path 21.